Cruise Tips First Time Cruisers Cruise vs Resort: Which Cruises are Really All-Inclusive? Did you know that the number of people taking cruises across the world has increased dramatically in the past few years? In fact, in 2019 cruise-goers are forecast to exceed 25 million! With such a huge amount of vacationers heading on a cruise, you may wonder, what’s the draw? Why not head to an all-inclusive resort instead? Cruise vs resort, which is the right vacay for you? Look no further, we’ve done all the research so you don’t have too. Are you ready? Anchors Aweigh! Cruise vs all-inclusive resort. Let’s take a look at both options to see there strengths and weaknesses. If you opt for a cruise, in your weeklong vacay you will visit several destinations without having to worry about flights. And if you are traveling in hurricane season, it may be a huge risk to book an all-inclusive Bahamas or Caribbean resort. You’ll be stuck while the rain pours down. But cruise ships take the weather into consideration and alter their route accordingly. This means you’ll get the best of the weather as you island hop. Most cruise ships also have dedicated free family-friendly programs so that the kids are always entertained. Although, if you don’t opt for an all expense paid cruise, some of these activities and meals may not a part of your package. You will have to pay extra, and those extras can add up. It’s always good to add these costs to your budget before you head on your cruise so that you’re not caught out later on. All-inclusive resorts are generally more relaxing than a cruise. And you can arrange your own schedule. You could spend all day on the beach or head inland to enjoy the sites, whatever you want, whenever you want! All-inclusive resorts include most things in their original rate. This means they are generally easier to budget, and you’ll have no surprises at the end of the trip. Even if it’s a cheap all-inclusive, it should include all meals, drinks, daytime activities, water sports, and beach and pool access. Some may even have free excursions added to the rate. Although there may be excursions and activities you have to pay for. For example, golf outings or tours of the local sites. They may not offer kids programs and activities for free either. Some all-inclusive resorts may arrange evening entertainment. But instead of Broadway-style shows, they will revolve around drinking and dancing. Resorts usually have bigger rooms than cruise cabins too. But if it’s a big resort you may find yourself spending a lot of time walking from one end to the other. Unlike cruises where you can visit many destinations in a short period of time, you won’t have to chance to explore so much from a resort. And if the weather is bad, you’ll be kicking yourself! 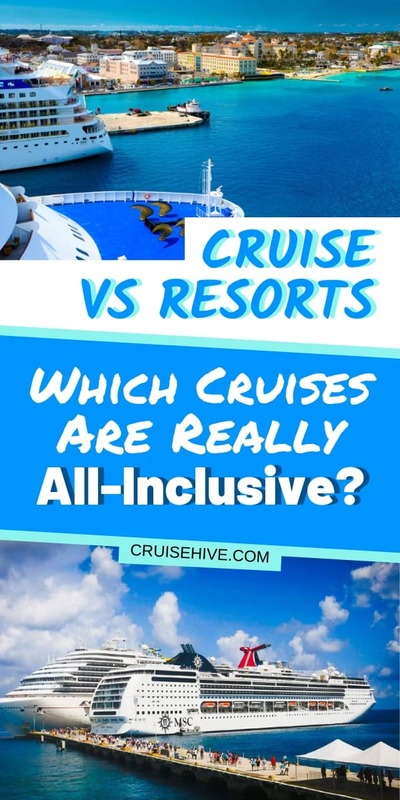 Cruise vs all-inclusive resort, which is more budget-friendly? This question is pretty impossible to answer as it all depends on what your personal vacation style is. There are cheap all-inclusive resorts, and there are cheap cruises too. On the higher end you could opt for an all expenses paid cruise or a luxury all-inclusive resort. It all depends on your personal budget and what amenities you’re going to take advantage of. In general, the base cruise fare will be cheaper than an all-inclusive resort. But you will need to add any extra purchases onto your cruise budget. For example, beverage packages, shore excursions, and specialty dining. Many cruises depart from US cities, which makes the travel costs cheaper than flying to a tropical destination. Sticking to the “free stuff” which is part of your travel package is the best way to save money on both kinds of vacations too. Once you’ve added up all your chosen extras for both all-inclusive resorts and cruises, you will clearly see which is the best option for you. So, have you decided yet? Do you need to phone a friend? Let’s review the main points to help you make a decision. If you’re still confused about which vacay to choose, check out these handy tips for first-time cruisers. Cruise vs Resort — What Will You Choose? So, cruise vs resort, which one floats your boat? As you can see, while both have there pros and cons, heading on a cruise has the upper hand. Unlike a static resort, heading on a cruise allows you to travel the world, all from the comfort of a sun lounger! If you’re looking for a cheap all-inclusive cruise you’ve floated over to the right place. Check out our mega deals for 2019 here.